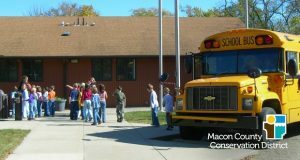 The Decatur Audubon Society will cover transportation costs for 20 school buses to take field trips to Rock Springs Nature Center or any of the five Macon County Conservation Areas, beginning March 20, 2019 until filled. This grant applies to any school in Macon County, or those serving students living in Macon County. Schools will be awarded free transportation on a first-come, first-served basis. Schools are encouraged to fill the buses with multiple classrooms or students from multiple grades. To participate in the program, teachers should inquire about the Audubon Transportation Grant when scheduling their field trip with Richie Wolf, Rock Springs Nature Center Manager at 217-423-7708. Educators can browse field trip programs in the new Educator’s Guide. This opportunity follows on the heels of the Decatur Audubon Society funding: 30 school buses in 2017, another 20 in partnership with the Macon County Conservation Foundation in spring 2018, and 20 more in fall 2018.